Sou | 1:31 AM Feel free to comment! No, not in the wonk sense - I mean really wonky in the weird, whacked out, messed up, not working for no definable reason sense. People keep trying to help him, but Willis is having none of it. Willis gets particularly riled by Nick Stokes, probably because Nick generally knows what he. Nick, is talking about whereas Willis doesn't have a clue about climate models, forcings, or climate science generally. June 4, 2013 at 3:18 am Nick, If what you say is correct, then why are the models so good at predicting the past and yet so bad at predicting the future ? June 4, 2013 at 3:27 am Clive, How do we know they are bad at predicting the future? Have you been there? 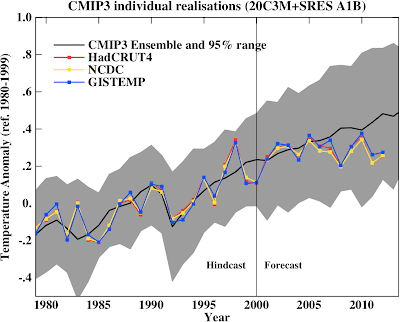 For more on climate models, try Climate Modelling 101. Or read Part I of an FAQ on RealClimate.org, which contains a link to Part II. You might suggest to Wondering Willis that he do the same. Isaac Held's blog - an excellent resource for advanced readers. 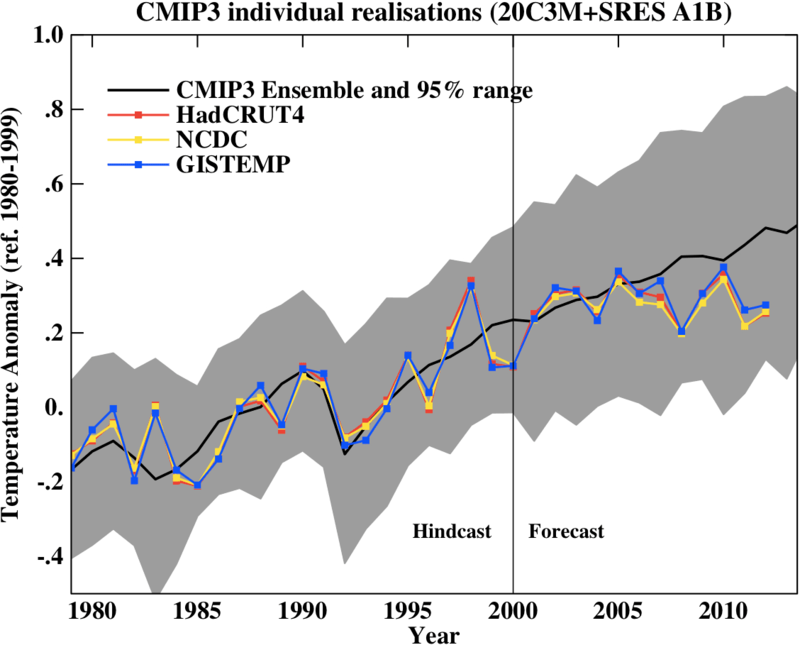 Ed Hawkins has a new article comparing CMIP5 with global surface temperature observations, showing observations are within the likely range according to the model outputs. Again, observations are within the range of model projections. (Click to enlarge). Climate models developed by climate scientists are way ahead of climate models promoted on WUWT, like this one from David Archibald. That’s… not surprising. In fact, it’s entirely expected – that temperatures will be some function of forcings and sensitivity. Trend T = F(trend forcings * climate sensitivity) – F( ) being a one or two box lagged function. The constraint is the certainties on the forcings; And that is entirely outside the models – it’s a set of separate measurements. If the forcing are estimated low, the computed sensitivity will be estimated high, if the forcings are estimated high, the computed sensitivity will be estimated low. Quite frankly, I would consider the linear trend relationship to be an indication that the models agree on internal dynamics – and that given similar forcings they will produce similar outputs. I would consider your results to be a support of these models, not a criticism. Here's the link to the Tamino article I provided in an earlier article- which has to do with Willis' curve-fitting and fancy equations.